Some artists are just not good at organizing. I am fortunate to have Geri working with me. Geri is very organized. I don't think I could do what I do without her help. My friend Lana Dobbs is more like me but she doesn't have a helper like Geri so things have gotten out of control at Lana's doll studio. Plus she has other challenges and problems like the world's worst internet service. I want to find a way to help. I have been inviting collectors to contact Lana through me but I have also had difficulty contacting Lana. I talked to Lana by phone yesterday. We got cut off 3 times while I was trying to give her information about Emails I have received from her collectors. During the conversation she was telling me about some of the problems she has had with her Email server. It's not getting better. In fact it has gotten worse. One thing is that she seldom has service, almost never. She has to go somewhere else to check her Email. Her location happens to be a place where the signal is weak and intermittent. Another problem is that the server started bundling her Email messages making it almost impossible to find anything. I called Lana back after the 3rd time we got cut off and told her I would print some of the Emails and mail them to her. I want to help Lana get her orders organized and under control. It wasn't much trouble to print out the Emails and put them in an envelope. I know one of Lana's collectors from overseas recently told me she was going to mail in her info to Lana. I am thinking that would be a great help to Lana if everyone who is waiting for a doll, mail her their info. Then if an order had been one that was lost, she will have a fresh copy. She could keep the "orders" together in a folder, arrange them according to the date of the order, not have to rely on the internet or try to remember all the various telephone conversations. Telephone calls from collectors tie up too much time even if the phone is working. So here is my suggestion. Print out copies of invoices, messages, pictures, whatever, pertaining to your order. Make your final choices and make them clear in your message. Make sure the date of your original order is clearly noted. Tell how you would like to pay and make sure the pertinent info is also included. Maybe you could put in a self addressed stamped envelop if you need a quick reply. If you are in the U.S. you should include your phone number so that Lana would be able to contact you if she needs to. Mail it to Lana Dobbs, 243669 E. County Road 554, Fairview, OK 73737. Old fashioned but simple and very helpful. PS Lana said she would acknowledge receiving your mailing by Email so be sure to include your email address. I'd like to introduce Doll Dreamers Guild Pro Artist and instructor Lana Dobbs. Fun loving and fearless, Lana Dobbs was certified to teach my eye painting techniques in 2005. 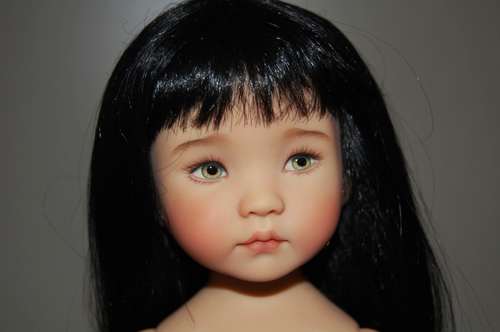 She has been pursuing excellence in doll artistry and teaching doll making since 1997. Lana is "Mom" to 3 grown up children and "Grammie" to 7 youngsters. She is one crafty lady with many skills and interests , and a dauntless spirit. She can do anything she puts her mind to. Recently, while working at my studio with a group of DDG members. 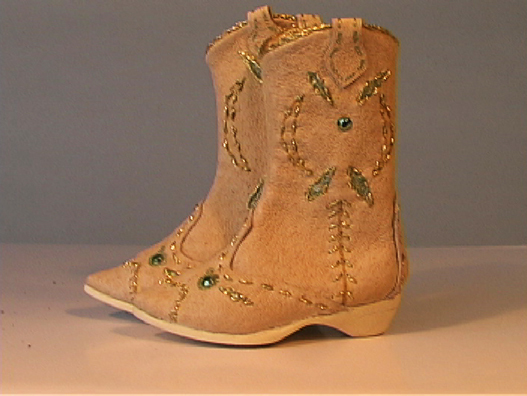 she spent a day designing and making this wonderful pair of western boots for a Hannah Montana type costume she is making for one of the 13" vinyl dolls. Lana is adept at and interested in all phases of doll making. She plans to specialize in painting the faces. While she enjoys costuming she welcomes the chance to team up with a design partner and paint custom orders. Lana believes that it is important for us as a guild to teach and encourage people to cultivate their talents and skills so that we can regain our self reliance and productivity as a nation. Here are a few Little Darlings without names, painted by Lana, who need a home. We are a very small company made up of family members and friends. My son, Ivan is our web guy. He also manages Expressions, our other small company. We don't have a high tech automated system like the big dogs such as Ebay. Everything must be done manually by Ivan. There will be a time lag before ivan can post the "SOLD" sign when a doll sells. These dolls are selling so quickly. The doll you "buy" may already be sold. If this occurs we will notify you by email as soon as possible and offer you 2 options. You can choose to have a refund or have a doll painted just for you by the artist. You can choose to have a doll similar to the one that was posted or you can request custom changes. We will send you a picture of the doll when finished for your approval. These basic dolls are not intended as one-of-a-kinds. They will be duplicated at our and your discretion. We apologize in advance for any diappointment we may cause. Life sometimes brings disappointments.....but life is good! Our aim is to delight you with our creations. Thank you for your kind patience and understanding. We ask you to make a deposit of $100 to secure your order. Let us know by E-mail which doll you would like to order, or your specifications for a custom doll. We have various wigs styles and colors available and are ready to work with you on your custom order. When we have your order we will then request payment by Paypal or Credit card for your deposit.